The world’s first denim jeans with a waterproof membrane come with a load of performance features — and a steep price tag. 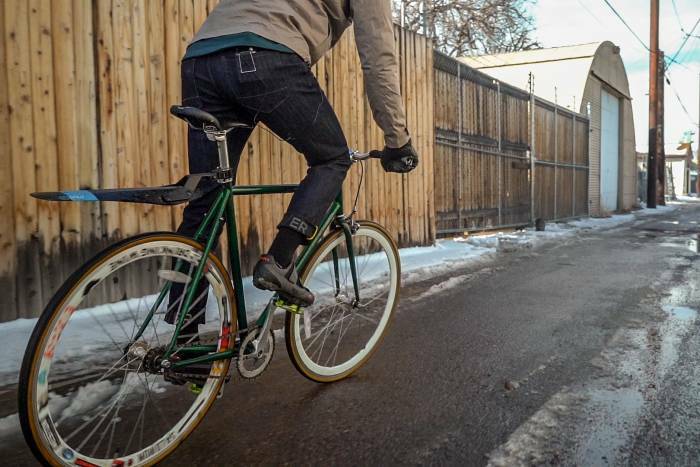 We tested these ‘weatherproof’ cycling jeans for this first look review. Today’s performance jeans are made with stretch, reflective accents, gusseted crotches, and special pockets. But one innovation — waterproof technology — has eluded denim. Until now. 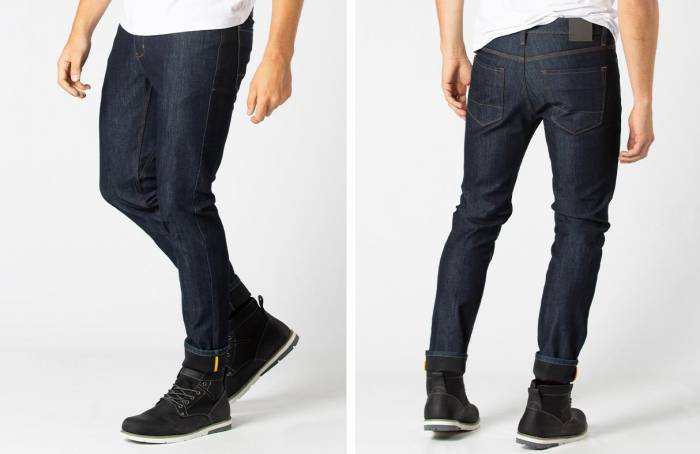 DUER released All-Weather Denim this year for $199. In addition to the latest performance features listed above, the jeans are also the first in the world to incorporate a waterproof membrane. Note the brand can’t call these jeans waterproof, as the waterproof membrane stops at the side seams. For breathability, the brand didn’t wrap the whole pant in the membrane, lest your jeans become leg-meat cookers. After a month of testing, the jeans left me perplexed. The waterproof tech works, but with a huge asterisk. 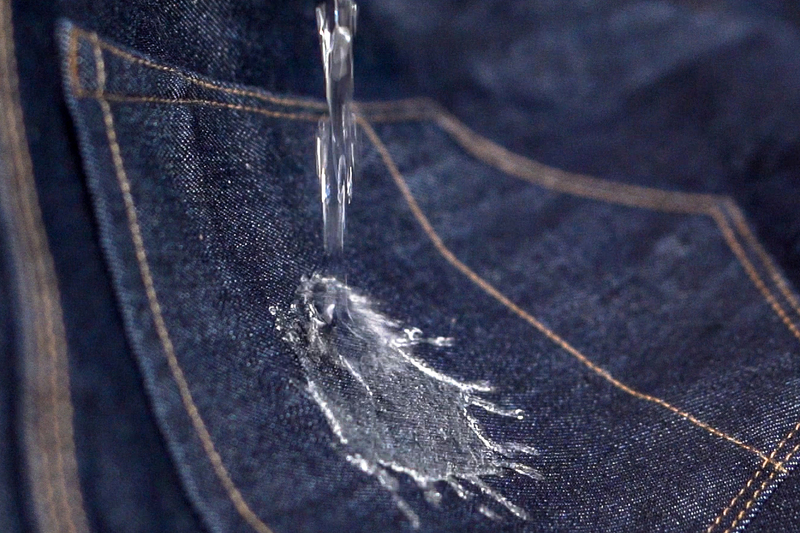 The denim on the outside still gets wet, but the water stops at the membrane, keeping your legs dry. Read on for my take on these first-of-their-kind jeans. On their own, the jeans feel great to ride in. And at first impression, they almost feel more like a soft shell as opposed to cotton. The membrane rests against your skin and has a swishy feeling — but I got used to this fairly quickly. In addition to the membrane, DUER uses spandex for stretch, CoolMax to regulate temperature, 3M reflective details, a gusseted crotch, and Silvadur treatment for odor neutralization. Over the inner waterproof membrane is the brand’s L2X Performance Denim. The membrane adds a water-resistance rating of 18,150 mm and a moisture vapor transmission rate of 13,000 g/m²/day. This surpasses industry baselines for water resistance and moisture wicking by a lot. So on paper, the jeans appear great. The idea of wearing jeans in the pouring rain to work and staying dry — without wearing bulky or ugly waterproof pants — is a huge innovation. Yet in my testing, I don’t think the mixture of technology is quite there yet. For over a month, if the forecast called for rain or snow in Denver, I wore these pants. During snow storms and slushy spring rains, I tested the pants. It’s clear the jeans’ cycling tech is dialed. 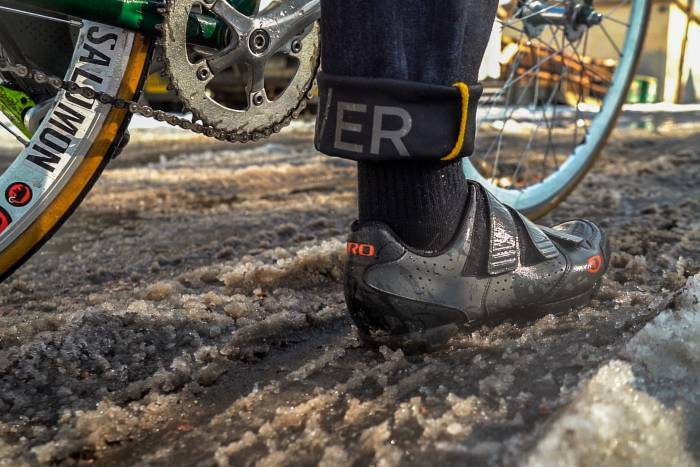 The All-Weather Denim feels great to bike in. My movement wasn’t restricted, and the reflective accents on the ankle cuffs help when biking at night. Yet the biggest caveat I had with the pants is that because of their construction — denim over a waterproof membrane — the outer layer still soaks up water. And after that denim layer absorbs all the water it can hold, it still feels like you have wet pants on. The waterproof membrane works, so my legs stayed dry. But having a soaking wet layer over a thin layer still feels like you’re wet. It’s an odd sensation, and one that I don’t want to have when I’m at work, or home, or the bar after commuting in these pants. I had to reach under the pants and feel my skin to check if I was dry because when these pants are wet, your legs won’t otherwise know. Given it’s still cold here in Denver, I’ve yet to test the breathability of these pants on a warm summer day. I’ll update the article once I have a better grasp of the pants’ breathability. I’ve bike commuted almost every day for the past 3 years. If rain is in the forecast, I’ll put on a pair of waterproof pants over my work pants. And then once at work, I take off the rain pants and am totally dry. This system works really well and is chosen by bike commuters across the world. After using the DUER All-Weather Denim pants, I’m left wondering who would opt for these pants over the aforementioned system. The price, $199, is more than enough to buy a nice pair of performance cycling jeans or selvage denim. To be fair, for intermittent drizzle or wet road spray, these jeans may dry out quicker than other jeans because the water doesn’t soak through to your leg. Yet if it’s downpouring, I wouldn’t use these as a substitute for a rain pant outer layer. So the one instance I see these pants working well is if I get caught in an unexpected rainstorm for a brief amount of time. If you never check the weather, then a just-in-case pant like the DUER All-Weather jeans gives you some peace of mind. Otherwise, these pants require such a perfect storm (literally) of variables — wearing while riding, riding in the rain, and not getting soaked — that I wouldn’t say the pants are worth the hefty $199 price tag. I appreciate what DUER is attempting to accomplish with these jeans, but I just don’t think it’s quite there yet. In the future, perhaps with a water-beading surface, this tech could prove hugely popular. Until then, I’ll likely opt for another DUER pant, like the Performance Denim, when bike commuting. And if necessary, I’ll layer a proper rain pant over them.